With the tightly wound intro spent, the rest of the song was much looser for the verse structure. Gerard Swift’s bass then ambled out of lockstep with the drums and the tune became footloose and fancy free. At least until the next tight chorus. This was one of those songs that once heard, was not to be forgotten. Why it was not a single is beyond me. “Too Big For Your Boots” was like a fearless blend of British music hall pop with skiffle-based choruses. The sprightly piano playing by Dave Fischel sounded like a loopy Floyd Cramer on happy pills in the studio; having a party of his own. The only thing linking the two tracks thus far was Judy Evans’ chirpy choirboy vocals. I loved “Waterbed Babies” and its Duane Eddy meets Gary Glitter vibe that just didn’t give a damn. The surf run carelessly tossed into the already mongrelized mix before the chorus was a thing of carefree beauty. I also loved the band’s slurred backing vocals which couldn’t be bothered to cohere into actual words! “Fun City Teenagers” breaks further ground with its acoustic guitars and the fruity clarinet of Alan Wakeman probably marks the first time a “licorice stick” made an appearance on a Post-Punk record. The band weren’t shy about sticking their moniker in their lyrics. Not only did “Warm Girls” sport their name but the zesty “£600,000” also did it in what was a meta-contextual song about selling themselves to the very best of their ability to a rollicking drum loop rhythm. Another cold ending happened here but the LP finished up after a few beats with a locked groove featuring the drum loop playing forever. The CD just quickly fades, alas. That is the one real compromise of this otherwise authoritative disc. 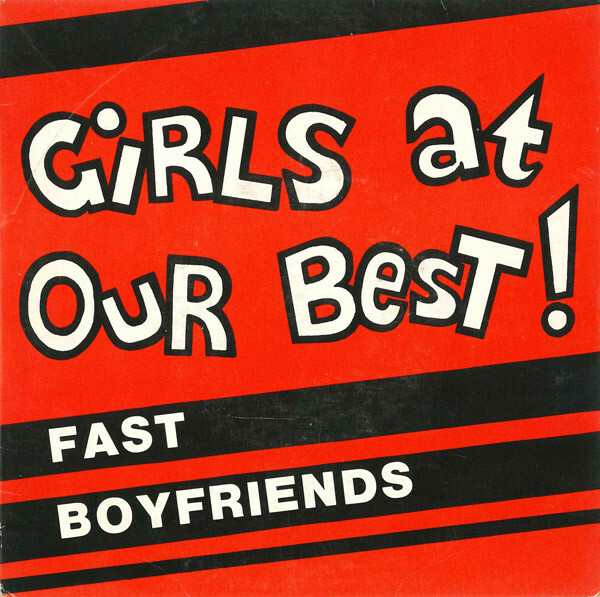 The only single actually pulled from this album, was the splendid “Fast Boyfriends” which satirized a girl who preferred beaus on a fast moving production line. The drumming of Carl Harper danced adroitly around the beat with swinging, emphatic fills that delight, as did the band’s backing vocals, which as ever, contrasted wonderfully with the high vocals of Evans. Another instrumental leftfield gambit occurred with “She’s Flipped” which pitted Dolby on synths while Dave Fischel countered with harpsichord! You just don’t hear records this gleefully batty every day. The traditional folk tune “This Train” was a final B-side [“Fast Boyfriends”] that got appended after the closing “Goodbye To That Jazz” to the running order on this CD. 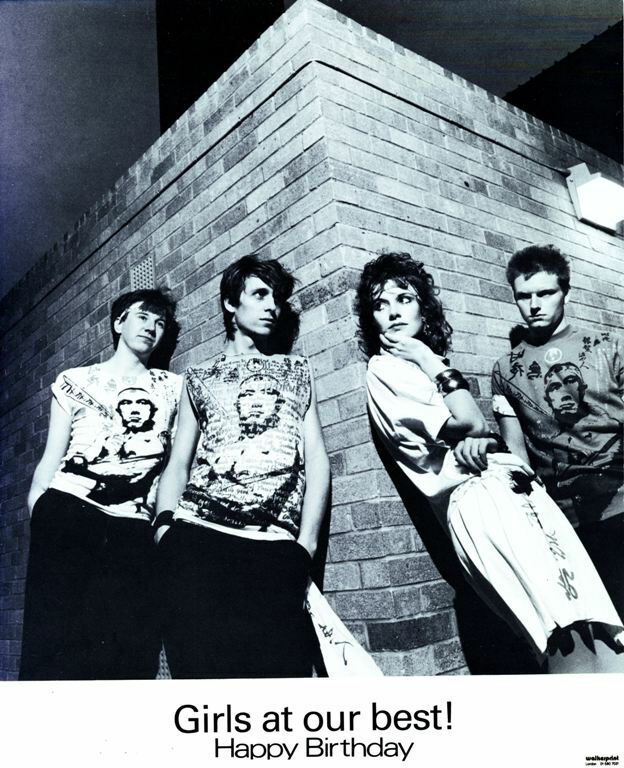 Post-Punk bands just weren’t doing old Woody Guthrie material at this time, but Girls At Our Best! obviously didn’t worry about fitting in, which was probably why this sprightly, witty, and inventive album failed to find an audience the first time around. If anything, the band sound as if they could have fit right in on C-86 but in the dour, post-Joy Division environment of 1981, they stood out like a sore thumb. This CD then featured the Richard Skinner sessions the band recorded, since the Peel Sessions had already gotten a 12″ release earlier, and there was only room for one session and this 68 minute disc just didn’t have the room. The Dale Buffin produced takes from February 1981 on the four songs added predate the final LP versions released in November of that year, but there significant lyrical differences to the tracks as recorded earlier. The song “Pleasure” said to “take the cat out for a walk and make it kill the mice.” By the time they made the album, that lyric had become the far more wonderful “take the cat out for a walk and help it kill the mice.” The changes wrought to “£600,000” were substantial with slightly less wry commentary on the machinery of commerce and the band’s name was not invoked in the chorus, but Jesus’ was! When I hear this band I hear echoes of their approach in bands like The Flatmates. Good lord, do I hear the foundations for The Flatmates being erected upon this album. The same D.I.Y. aesthetic with witty lyrics and a female-led singer, but I have to say that GAOB really hit the right marks on this album. I loved it in 1982 and my ardor for this album has not diminished a whit in the intervening 36 years. We are most fortunate that our friends at Cherry Red saw fit to release this executive version. No home should be without it. This entry was posted in Record Review and tagged 1981, 2009, DLX RM, Girls At Our Best!. Bookmark the permalink.